While some may love their oats for breakfast, I love my eggs for breakfast. I wish I could say that I get bored with these sometimes, but I just don’t. How can one go wrong with so much protein, greens and complex carbohydrates in the morning. My body hurts, I don’t think there’s a single muscle on my body that isn’t sore. It’s great that today is rest and stretch day. My trainer told me today that I need to stretch and foam roll as much as possible so I don’t get sick. I had never heard that before. He told me it won’t necessarily prevent illness, but helps with recovery process and therefore helping prevent injury and illness. I also see this is as another reason to get enough sleep and eat as well as possible. Does anyone else have a breakfast obsession? As much as I love my breakfast burritos I do like to try new things. Last weekend started with a dear friend’s bachelorette party, since this isn’t a party blog I won’t go into the details of what we did. Instead I’ll share with you some of the food and beverage choices I made starting with dinner on Friday at Adobo Grill a fairly traditional Mexican Restaurant. There were eight of us and we shared a bunch of small plates. 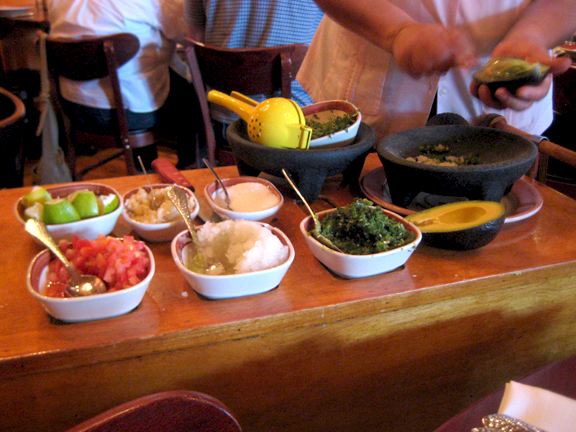 We ordered tamales, sopes, quesadillas, ceviche, salmon tacos and guacamole – which is some of the best in the city. A woman rolled out a cart to our table and made it our heat preference: mild, medium and hot. 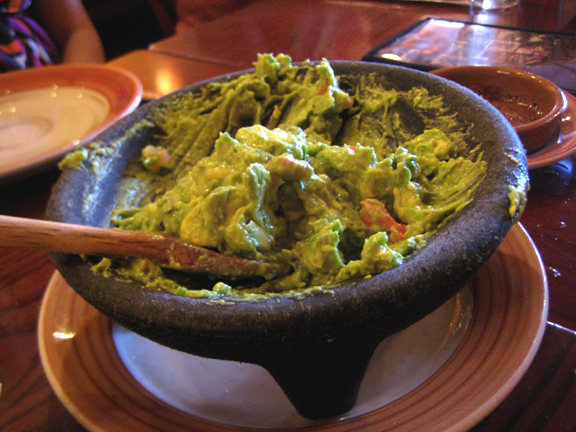 They make guacamole just like how I would make it at home, amazing! We loved it so much that we ordered a second bowl. The sopes, they look pretty but were disappointing in flavor. 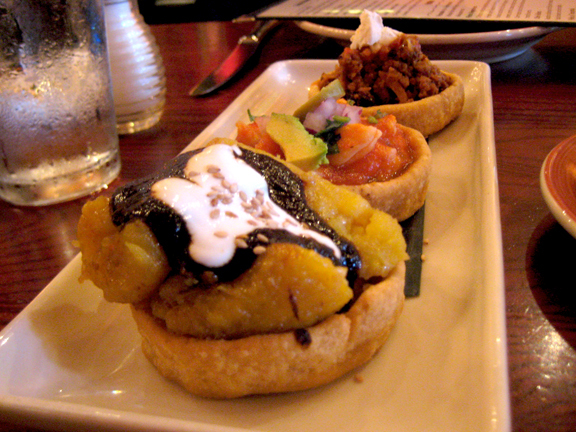 The first one was filled with plantains in mole sauce, the middle was filled with shrimp in salsa and the third one pork with goat cheese. The pork one was my favorite of the three, but I wouldn’t order these again. During dinner and the rest of the weekend I didn’t pay attention to food portions, calories, ingredients, labels or protein intake. Whatever was in front of me I ate. I didn’t feel guilty nor do I regret what I ate. In fact I enjoyed most of it, it was delicious. What I didn’t enjoy was the full feeling I had, the feeling of the tortilla chips sitting in the pit of my stomach until the next day and the insatiable thirst I had due to high sodium intake and putting on 3 lbs of water weight. Eating junk food once in a while and going overboard is a reminder of why I choose to eat clean everyday. Also, I had two alcoholic beverages the entire night, I can only imagine how much worse I would’ve felt had I drank more. For those of you not familiar with Warrior Dash it’s a 3.3 mile obstacle course with cargo nets, mud pits, barbed wire, fire and more mud. This race was awesome! We signed up for the second run of the day at 8:30am, a very smart decision. The course gets muddier and muddier throughout the day as thousands of people run through it. I finished with a time of 39:33.60 that put me in the top 20% overall and top 7% for my gender age group. Because of all the muddy obstacles I couldn’t run with my Polar heart rate monitor, normally I rely very heavily on it. I felt a little naked at first but once I got going I didn’t worry about it. This was the first race where I pushed myself so hard that I had to stop at one of the water stations to pour the water on my head to calm down. What can I say, I got excited. I’m always trying to beat my own time and do my personal best. I also know that my racing was impacted by the way I ate over the weekend. I definitely felt slower than normal, I won’t have to learn that lesson again. Have I mentioned how much I love racing culture? If you’re reading this and have never participated in a race I don’t care how slow you think you are, DO IT! You can thank me later. I’m considering a new kind of challenge for next year the 10-mile Tough Mudder. I wonder who I could get to do it with me. Who’s in? Have you missed these? I know I have. 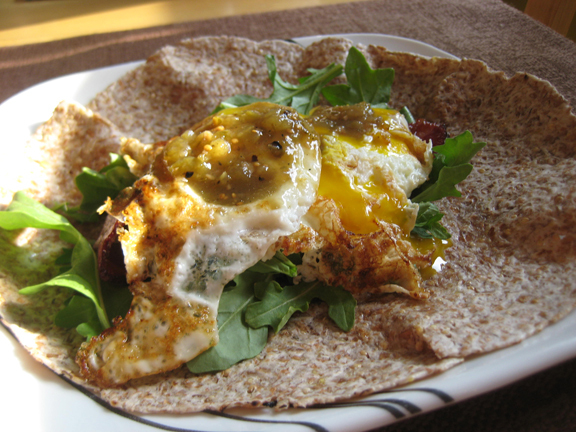 Now that I’ve discovered Ezekiel Sprouted Grain Tortillas the breakfast burritos have made a major comeback and will be here for a while. Tonight I am going to enjoy Chicago’s nightlife in honor of one of my oldest and dearest friends for her bachelorette party. I can’t tell you what we’ll be doing in case she reads this, it’s a surprise. 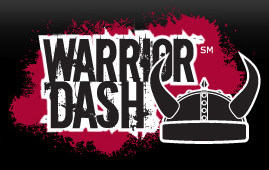 Also this weekend I’m doing another race, the Warrior Dash. It’s an 3.3 mile obstacle course with fire, planks and a mud pit. I can’t wait to share all of the photos. I love doing mud races, they are so out of character for me and so much fun. 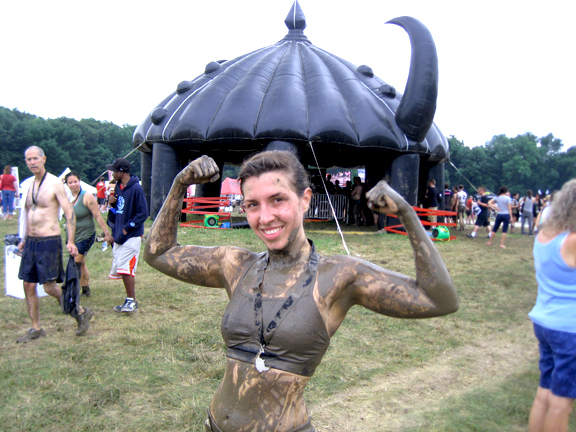 Have any of you ever done any mud races? Would you? No matter what I did yesterday I couldn’t get on the right foot. I woke up late, drove to work in horrible traffic, forgot to take my supplements during the day, drove to the gym in horrible traffic and to top it off the parking garage at the gym was under construction. All of that was fine, not even too much of a problem, but I forgot my gym clothes at home and I had a boot camp class with Armando that was part of my 1/2 marathon training, a class that I had paid for and could not make up. So I bought new gym clothes. I made it to class and you know what I’m really glad I did. But it got me thinking, is this ‘normal’? Is this just a testament to my commitment to working out? Or am I just crazy? For me the former is true. There is very little that will get in the way of me and my time at the gym, especially if I’ve already paid for class or a personal training session. I really like to get my money’s worth when I pay for something. That’s a major motivating factor, it’s worth it to me to pay to keep me motivated when sheer will won’t do it alone. I think that everyone has their source for motivation, what’s yours? Midnight is a great time for making muffins. 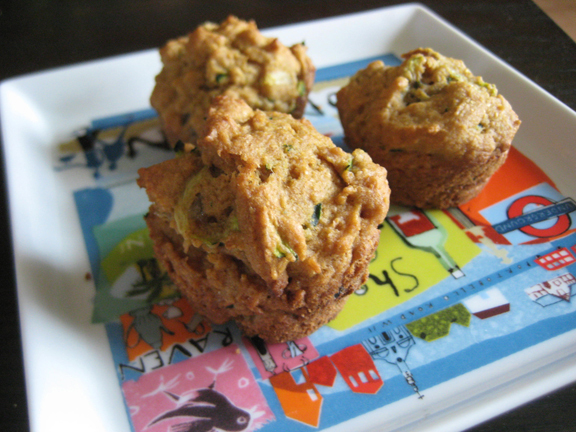 A few months ago I discovered these vegan zucchini date muffins on ChoosingRaw.com. They are absolutely delicious. I’ve been craving them for a few weeks and now that I’m running more I want to have plenty of clean post-run snacks around. Not sure that midnight was an ideal time to bake these but I will be so happy when I have them after today’s boot camp. Also, since it’s gotten warmer I’ve been obsessing over Arugula. This is the third day in a row that I’ve prepared this salad. Saute the shrimp in coconut oil over medium-high heat, toss all ingredients in lemon juice and enjoy. 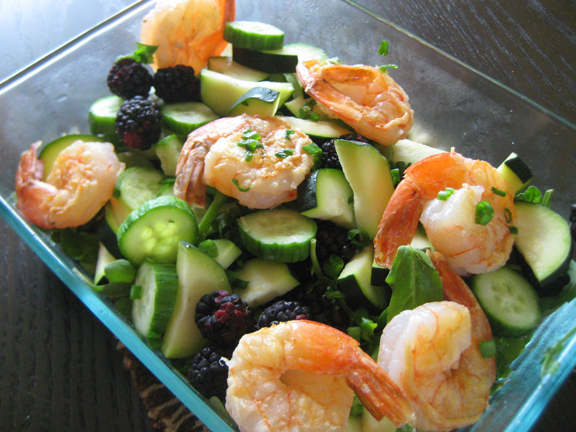 This salad takes less than 10 minutes to prepare. For all of you muffin lovers I leave you with, Muffins, a clip by one of my favorite comedians. Which seasonal fruits and veggies are you craving right now? Do you have a favorite muffin flavor or recipe? I’ve officially completed my first week of half marathon training. So far so strong. As I mentioned I signed up for a special 10-week training program with Armando at my gym. (P.S. He has a guest post coming up soon about massage therapy). The training program includes a boot camp class once a week, a personal training session once a week, a 10-week running schedule and a nutrition expert looking at how I’m eating. Given all I have learned about my body this past March (the resting metabolic rate and SubMax tests) I want to be under careful supervision for this race. What I’m most excited for is fine-tuning my training. In the past I’d created workout plans for myself for races and that worked just fine. I now want to focus on taking racing to the next level to be stronger, faster and more efficient. I’ve set a goal of finishing this race in under two hours, it’s really going to take some diligent training on my part to accomplish that. Some things that are different this time around are that I’m focusing on strength training, stretching, foam rolling and eating for endurance sports. Yeah I will do the running, but I really think that for me to get faster and stronger I need to incorporate all of these other aspects of training. For you runners do you think about strength training and stretching when you’re training for a race? For you non-runners, does this make running races more appealing to hear that stretching and strength training are crucial components to running? Recently I told a friend that I am not a runner. Really. I’m not. As a young girl, I watched Ironman competitions on TV thinking it was the coolest thing ever and that I could never do that because I am not a runner. In high school, I had a hard time running a 12-minute mile, I think my fastest was 13:30. Always in the back with the slow pack. In college I dabbled in treadmill and never made it much past 2-miles @ 12-minutes a piece huffing and puffing the entire time. Then came the late twenties when I tried my hand at triathlon, I did 6 my first year. I’d smoke most people in the water, I felt strong on the bike and everyone would pass me when it came to the run. The fact that they were all passing me didn’t even matter, I felt slow. My legs were heavy and my lungs never quite big enough. I was not a runner. I don’t like feeling limited. I don’t like to feel like I can’t do something. So I signed up for a 15k race. Had Armando train me for it. I finished with an awesome pace. I signed up for a 10K. Armando kept training me. A month later I ran it and shaved a minute off my pace. All of sudden I was capable of running 9:15 miles. That was fast for someone who’s not a runner. This year, I completed a 3.5 mile race and to my surprise was the fastest woman in my company. Two days later I completed a 10-mile race. The 10-mile run felt awesome. Sure people were passing me up, but I felt fast. Legs were strong, I had plenty of space in my lungs, I felt like I was flying. I was a runner. Now I wonder what else I’m telling myself that I’m not capable of that I can actually do. I have a few ideas, but I bet I’m not alone. All those things you don’t think you can do, I bet you can. Is there something you’ve recently accomplished that you were sure you couldn’t do? What’s something you tell yourself you can’t do? Where oh where have I been lately? I’ve been exercising, racing, eating well, meeting blogger friends, traveling, co-planning fundraising events and enjoying the Chicago summer. 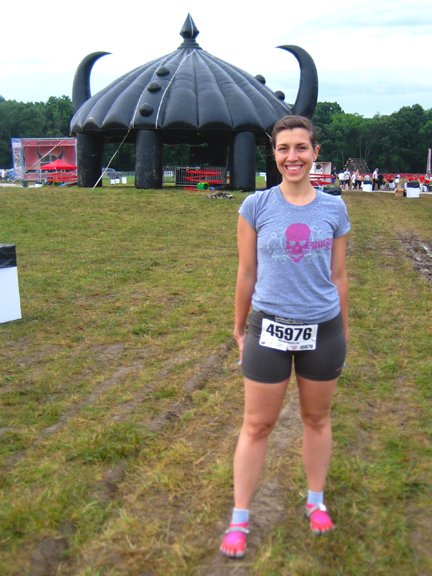 • Chase Corporate Challenge – Finished in 29:54, I was the fastest female at my company. • Soldier Field 10-Miler – Finished in 1:42:11, 10:14 pace, my longest distance race to date. • Rock N Roll Half Marathon – Registered for this race and signed up for a special training program at my gym. This will be my longest race ever. I’ll be blogging about my training as I go along in the coming months. 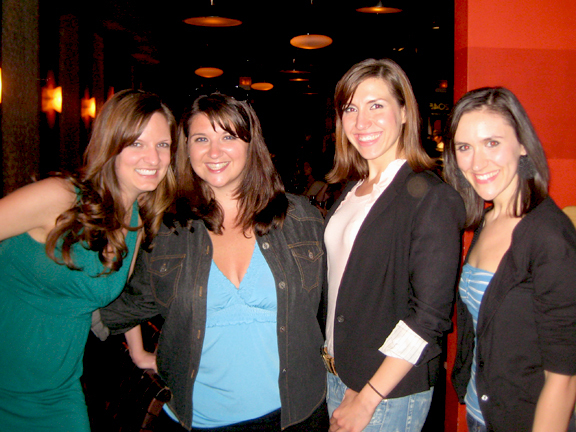 Also in the last week I met some blogging friends: Tiffany, Amy and Stacie. Thanks to Tiffany for coordinating the meet-up and picking a great spot, Coast Sushi in Bucktown. I officially love blogger meet-ups. Usually I get nervous meeting new people but you would have never known it with these ladies, we were chatting it up like old friends the entire three-hour dinner! I ordered a seaweed salad and sashimi, two different tunas and salmon. I’m not terribly picky about sushi, very easy to please. This place was especially fresh. I love sushi because it’s so easy to eat clean as long as you avoid the mayo and fried stuff. 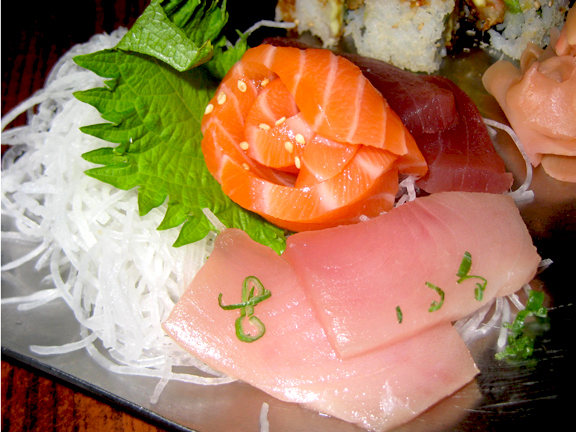 Sashimi is my dish of choice, unless brown rice rolls are available. 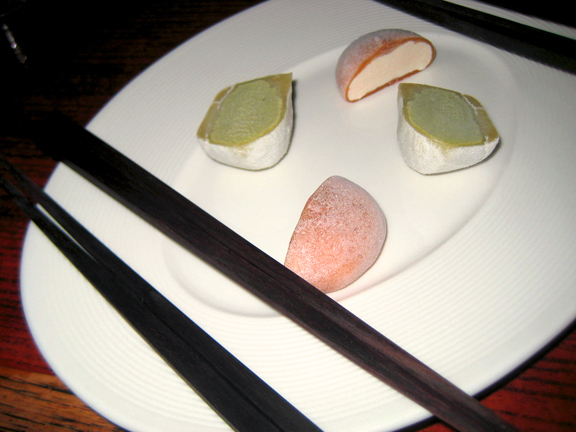 For dessert three of us split four pieces of mochi ice cream. The pink one (tiramisu) was AMAZING! A small bite was the perfect end to the meal. I was very happy to break my routine of staying in on Thursdays and go out to meet these women. Looking forward to the next meet-up. What have you all been up to in the last couple of months? How have your fitness goals been going? Has anyone competed in any races or fulfilled on a weight loss goal? I’d love to hear from you! Happy earth day everyone! I’m ba-ack. 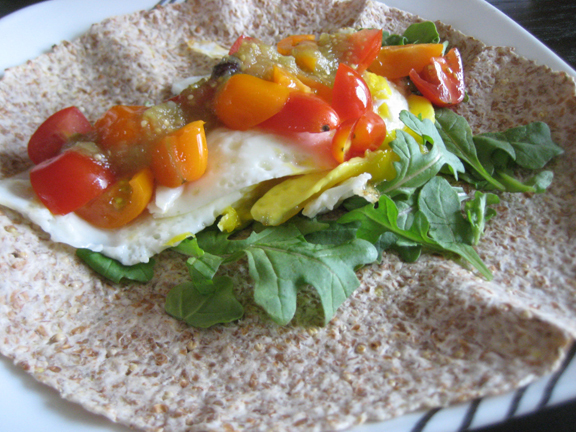 After a month-long hiatus from blogging I am back and ready to share my food and fitness adventures again. Over the past month I’ve made many changes to the way I eat and workout. For a couple of weeks I have been keep track of my calorie intake via sparkpeople.com to see how many calories I am actually consuming throughout the day. Initially when I began to lose weight and lean out the thing that made the biggest difference was keeping a food journal. I wrote down everything I ate and that way I was accountable for it. I wouldn’t track calories but I used it as a system to make sure I was eating the right kinds of foods. Now that my goals are more specific – I want to lose 3% body fat – I have to be more rigorous with what I eat and make sure I eat enough calories. The nice thing about that site is that it gives me a breakdown of the types of calories I am consuming. They have a cool pie chart of my fat, carbohydrate and protein intake. What I don’t like about Spark People is the user interface. It loads slowly even on a high-speed internet connection. It’s a very frustrating. There are also lists of foods with nutritional information pre-filled, but many of the specialty foods that I eat like grass-fed ground beef are not in the system. So I have to go to other sites find the nutritional content and enter it myself. I’ve stopped using it and am on the hunt for a different calorie tracking program. If anyone has suggestions I am willing to try it. On the workout front, I have been working out for longer periods of time, less intensely. It’s very different from running as fast as possible and always going all-out at the gym. It’s a nice change of pace but it’s taking some getting used to. I’m spending more time at the gym. I’ve been planning my workouts around the time CSI and all the crime shows are on so the time flys. Finally, I have been cooking up a storm. Making sure that I have enough food with me throughout the day. That’s been a bit of an adjustment as well, but I love trying new foods and new ‘clean’ recipes. 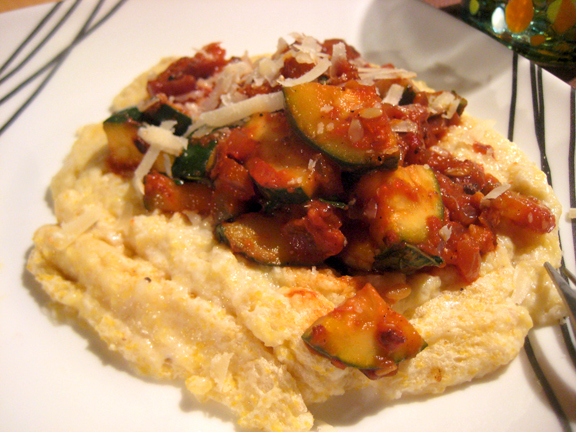 This was dinner from earlier this week, cheesy corn grits with a zucchini shrimp saute. It was delicious and the recipe is from this month’s Clean Eating magazine. The recipe is even more delicious than that it looks and it serves 6, I’ve made about 5 meals out of it. Have any of you made any changes to your eating habits or workouts? Do you have a calorie tracking program that you just love? I’d love to hear from you. P.S. This is a random piece of news, but my super awesome brother and I were featured in an article in the Wall Street Journal this past Tuesday. This past weekend, I had one of the most informative weekends of my entire fitness-junkie career! I got a Hydrostatic Body Composition test, a Resting Metabolic Rate (RMR) test and VO2Max test. Some of you may be wondering what in the world these are, so before I get into my results and how they will impact my training (and eating) I’m going to explain a little about each of the tests and why they’re important. If you’re familiar with these tests, skip over this next section and get to reading at the end. This is a fat test. Without going into too much complex detail, the way that this works is you get weighed on an underwater scale. You go into a tub and submerge your entire body onto this underwater scale, while underwater you blow out as much air as you possibly can from your lungs. This technique is more accurate than a fat scale, body pincher or hand-held body composition scanners at the gym. It’s actually more important to know your body fat composition than your weight. Say what?!? The reason for this is because someone can be very thin and in the normal range of weight while having a high body fat percentage and on the flip side someone can be on the higher end of the scale and have a low body fat percentage. Also, the fastest and most efficient way to change the way your body looks is to lower body fat and build lean muscle. Read more about body fat tests. This test determines how many calories you burn while at rest. The way the test works is you sit in a comfortable chair for 12 minutes while breathing into a tube. The importance of this test is to determine how many calories someone needs to lose, gain or maintain weight. It can explain why despite eating a low-calorie diet you’re not losing weight. Believe it or not if you’re not getting enough calories that can hinder weight loss and muscle-building. Our bodies are very complex systems and there is more to meeting fitness goals than just exercising more and eating less. The VO2max test measures your maximum level of exertion, in other words it measures how intensely you can possibly work-out before you can’t workout any more. It distinguishes if you are burning body fat, muscle & fat or purely muscle as you exercise. This test is performed on a treadmill while wearing a mask and breathing into a tube. Since I am someone who is interested in burning fat it’s important for me to know my fat-burning zone, so that I can train in the fat burning zone. Since I want to build muscle and keep it on, I don’t want to be in the muscle-burning zone. These are all very generic explanations of each of the tests, but hopefully you can get the idea of what they are and why they’re important. If you want any further explanation, leave a comment saying so and I’ll have Armando answer your questions. I am very happy to have taken the above tests, because now I have an actual baseline to track my results. My body fat percentage is 16.4%, for a 30-year-old female 20-25% body fat is considered good. Naturally I am very happy to have a low body fat percentage. I see this as a testament to the healthy lifestyle changes I have made over the past years and all that my trainer has taught me. As of Sunday I am no longer going to try to hit a number on a scale. Armando has been trying to beat into my head that the number on the scale doesn’t matter, he’s been saying “it’s all about how your clothes fit, the way you look in the mirror and the number on the scale can remain the same but your body and it’s shape will change dramatically” (muscle to body fat ratio). My stubborn-self (what can I say I’m a Taurus) wanted to base things on the scale, so I would weigh myself and allow my moods to be affected by the little digits on the blue screen of the scale. I am finished with that. I am also going to be eating more which will result in having more energy throughout the day. Additionally the trainer is changing up my workouts for me to maximize the amount of muscle I keep on my body. Well, that’s not entirely true, he’s been telling me to do some of these things all along. There are some habits that die hard, I would do certain things my way and not listen to his instructions. I’ve been able to get very fit and produce some amazing results despite my stubborn Taurian ways. I think I’ll let the expert do his job now and I’ll follow his instructions. I’ll be getting the tests again in the next six months so I’ll have plenty of time to track progress. Have you gotten any of these tests? If so, how did it impact your training?